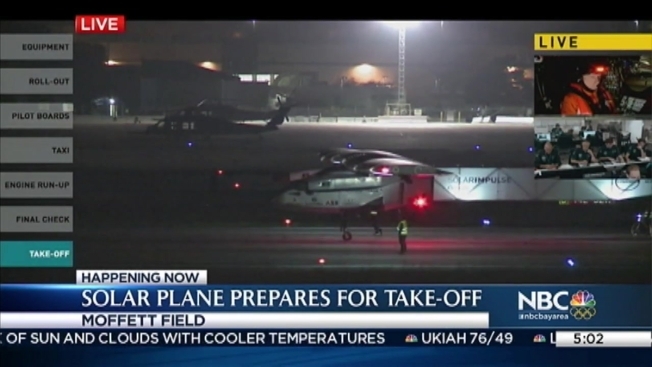 The Solar Impulse 2 left Moffett Field in Mountain View early Monday morning before the sun came up following an extended stay in the Bay Area due to weather concerns. Now, the solar plane, which is in the midst of a trip around the world, is headed off on a 16-hour flight to Phoenix, Arizona. The plane took off at 5:04 a.m. It travels at about 47 miles per hour. The plane's whereabouts can be tracked live on the SolarImpulse website. The journey for the 5,100-plane is historic because it's powered by 17,248 solar cells on the winds and is on a mission to be the longest endurance flight - and the first solar-powered one - across the Pacific Ocean. On Sunday, crewmember Elke Neumann said crosswinds in Phoenix had been too high for the plane's expansive 236-ft wingspan to bear, giving the team cause to stay in the Bay Area a little longer than they had planned. The team was planning on taking off on Friday. All told, the plane and its crew spent a week in the Bay Area after making a three-day flight from Hawaii across the pacific. The pilot, Andre Borschberg, spent a whopping 62 hours straight inside the small cockpit during the journey. Solar Impulse 2 will make three more stops in the U.S. before crossing the Atlantic Ocean to Europe or Northern Africa.